Forthcoming meetings and timings for 2018. Each meeting will take place on every 2nd. Tuesday of each month starting at 7:00pm. 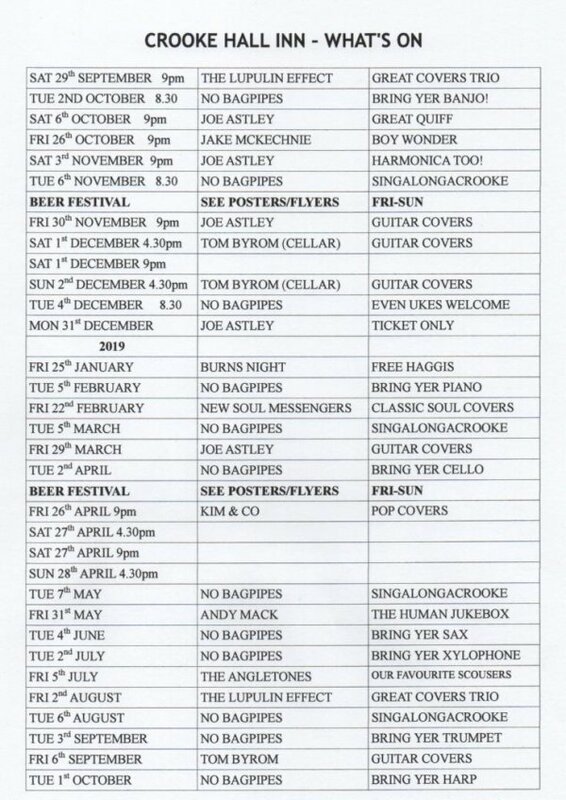 Until further notice, the meetings will take place in the cellar bar or in the main lounge upstairs in The Crooke Hall Inn depending on the landlord. 2nd. meeting. Tuesday 12th. February. 7.00pm. 4th. meeting. Tuesday 12th. April. 7:00pm. 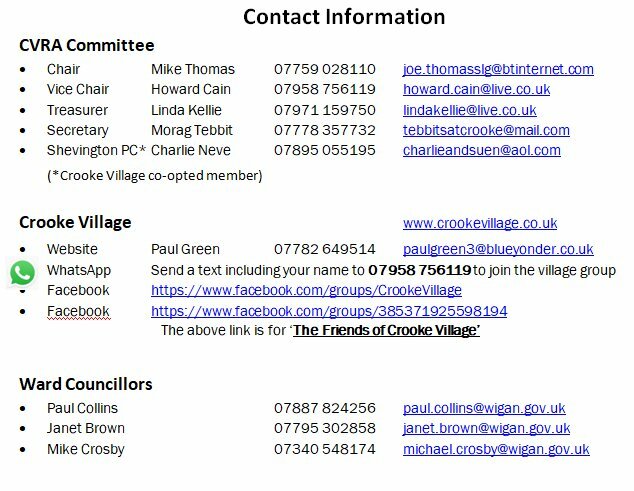 If I receive it in time, the agenda for the next meeting for Tuesday the 14th of May 2019, which will be the Crooke Village Residents Association monthly Meeting will be posted below. In the event I do not get them in time, I have posted the details, part of the agenda that informs you of who is who and what postion they presently hold, along with their contact details. The next meeting will be held in the usual place, The Crooke Hall Inn. 5th. meeting. Tuesday 14th. May. 7:00pm. 6th. meeting. Tuesday 11th. June. 7:00pm. 7th. meeting. Tuesday 9th. July 7:00pm. 8th. meeting. Tuesday 13th. August 7:00pm. 9th. meeting. Tuesday 10th. September 7:00pm. 10th. meeting. Tuesday 8th. October AGM 7:00pm. 11th. meeting. Tuesday 12th. November 7:00pm. 12th. meeting. Tuesday 10th. December 7:00pm. 1st. meeting 2020. Tuesday 14th. January. 7.00pm. All residents and tenants of the village are reminded that they are all welcome to come along to offer their support or voice any concerns, opinions or issues that they might wish to raise. Suggestions as to what we could do as a community, for the community to organise an annual event would be welcomed. I am presenty waiting for the program for 2019 to be delivered to me. When that happens, I will post their forthcoming events below. Thank you. Normal Sunday Services start at 11:00am. During the year, Dawn Glynn uses the chapel to support her C.H.A.N.T. program where she carries out Art and Crafts events for interested members of the communite in which to paticipate. Her events are usually listed within the C.H.A.N.T. page on the website but if there is a notice to share, I will show it here. Tuesday Every second Tuesday of every month, CVRA Meeting 7:00pm. Wednesday Starting at 8pm, Pies & Cider night. £5 per ticket. Friday Open for hire for private functions, £50 for the room. Saturday Live music every saturday 9pm, free admission, flyer below & private functions room open for hire at £50. Sunday Open for hire for private functions, £50 for the room. The Bar opens at 12.00 noon till 11.00pm Sunday through to Thursday and from 12.00 noon untill 12.00pm Friday and Saturday. It is strongly advised to book for Sundays which is always busy. Constantly changing specials boards inc seafood board & early budget specials served till 4.00pm Mondays-thursday which may or not be on so you will have to ask?. The pub sells Semi Skimmed Milk to boaters mainly but to anyone else upon request and Joe Shovelton comes into the pub at around 8:30/9:00pm on Sundays to sell Chicken, Duck and Goose eggs. Dean McDonnald is the present Landlord and for the present, all the previous arrangements are still being honoured. See you at the next meeting? The pub telephone number is 01942 236088.